Before we see the road-going version of the reborn Supra, a racing concept will be shown at Geneva next month. A was recently shown focusing on the car’s massive rear wing and a double bubble roof. Ahead of its Geneva reveal, new images of the car from Japan’s Best Car magazine have been posted on . Despite reports suggesting the new Supra won’t be badged as a Toyota and will instead be branded as a Gazoo model, these leaked images seem to suggest otherwise. According to the site, the car that will be shown at Geneva will be called the Toyota Supra GRMN Racing Concept. The rear wing on the car shown in leaked images certainly seems to match the teaser image so it appears to be legit, while the racing livery matches other Gazoo racers. It also features hood-mounted air intakes, a rollcage, Sparco racing seats, and Bridgestone performance tires. No technical details have been posted, however. Images of the road-going Supra were also published in the same magazine and shared on SupraMKIV.com. As expected, the overall design looks like the Toyota FT-1 Concept, albeit with a less prominent front nose. 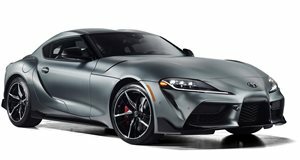 Recently leaked specs suggest the road-going version of the reborn Supra will be powered by a 3.0-liter turbocharged inline-six producing 335 hp and 332 lb-ft of torque, which will be sent to the rear wheels through an eight-speed automatic gearbox. 0-62 mph will take 3.8 seconds. It will also have similar dimensions to the last model, measuring 4380 mm in length, 1855 mm wide, and 1,290 mm high. It will also ride on a 2,470 mm wheelbase, while curb weight will reportedly be 3,284 pounds. As for when we’ll finally get to see the new Toyota Supra road car, reports have suggested it will be shown later this year. If we had to guess, this year's Tokyo Motor Show in October seems like the most logical venue to reveal the rebirth of one of the most iconic Japanese sports cars.